Key driver/influencer analysis using the newly released Power BI “Key influencers” visual. 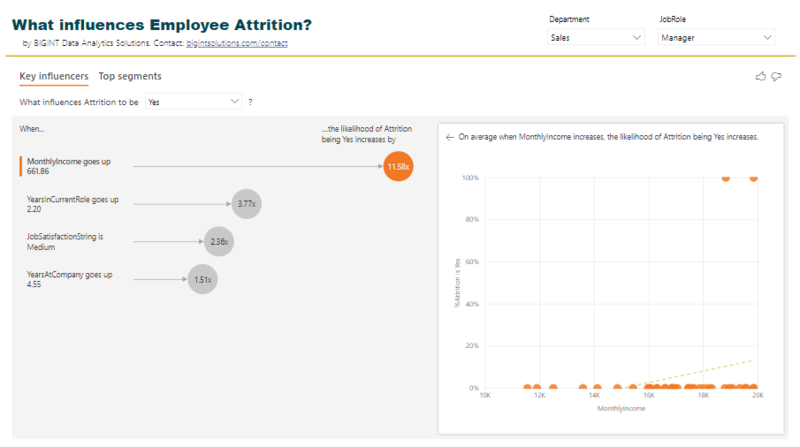 What influences employee attrition? Overtime? Job Level? What influences employee attrition in the Sales Executive role? Distance from home? What influences customer attrition? High call rate? International Voice plan? Knowing answers to above helps in decision making. If employees in Job Role “Healthcare Representatives” leave the most because of the distance from home, maybe offer them fuel reimbursement or maybe offer them accommodation expenses if they stay near to office? The newly released Power BI “Key influencers” visual (released as part of Feb 2019 Power BI Desktop release) aids such analysis very very quickly with no code! Crazy! 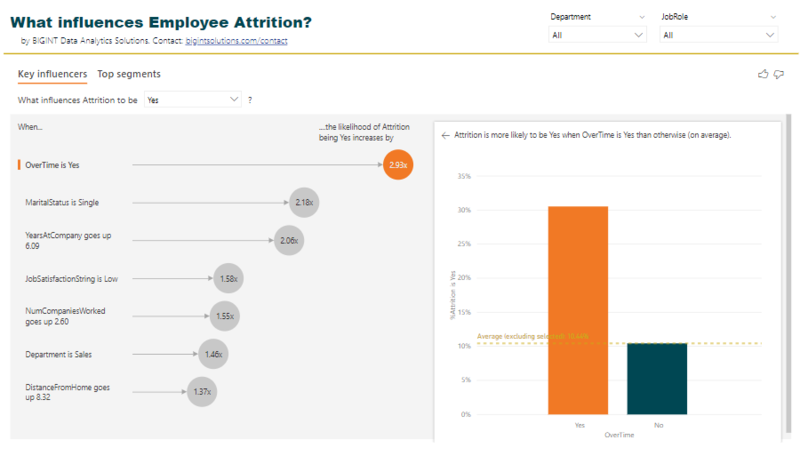 We applied this new visual to analyze what drives employee attrition, and I must say, I’m blown away by the outcome, ease of use, and comprehensiveness of the visual. Download Power BI report and play with the visual. But, how does the result look like? From the visuals above we can clearly see what influences our variable Attrition=Yes. OverTime, MaritalStatus, YearsAtCompany, JobSatisfaction, and so on. Not only that, the visual also provides the values of the factors which influences our variable of interest the most. How to interpret the visual? The likelihood of attrition increases by 2.93x if employees are doing overtime. Or, Attrition is 2.93x more likely in the employees who are doing overtime. Hmm… if you do overtime, you may quit. This is obvious. The attrition is 2.18x more likely if employees are single! Attrition is also high if the Department is Sales. The left-hand side view of Key influencers shows all the factors influencing our “Attrition=Yes” by a factor of 1.0 and above. The right-hand side view shows the distribution of data with respect to the selected factor and Attrition either as a column chart or a scatter plot. There is another view of this visual where we can see Top segments with high attrition % and their characteristics. The visual identified 4 segments with high attrition % along with population count. Clicking on a bubble shows us the characteristics of that segment. Segment 1 with Attrition % as 57.6 has employees in Department Sales, DistanceFromHome > 11, JobLevel is high and OverTime is Yes. 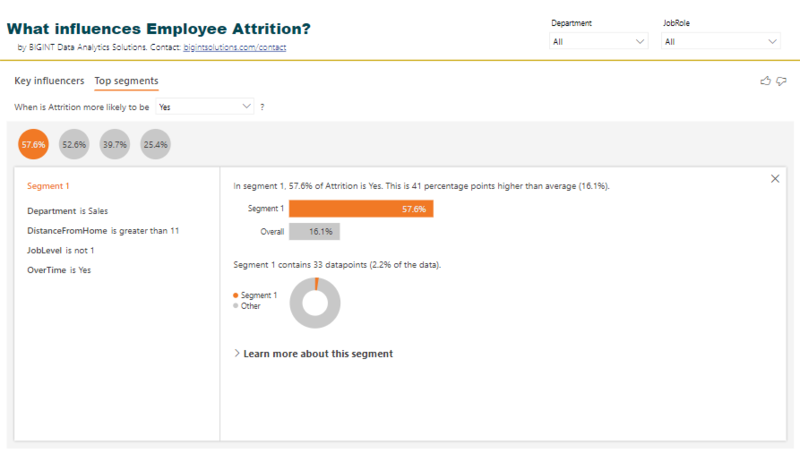 You can further drill down this segment by clicking on “Learn more about this segment” and see what other factors influence this segment. Can I filter this visual? Yes, you can. Example: Why are employees in job role “Healthcare Representative” leaving the company? Filter the visual and the analysis changes! 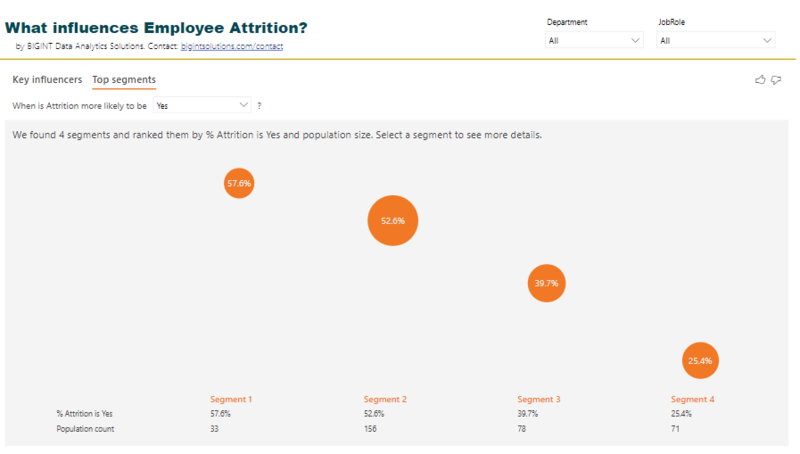 Yes, you can select individual influencing factors and see the distribution of Attrition % by the selected factor. Can I hover over the values in the scatter plot above? Can I see the logic or p-values associated with factors or key influencers? No, not yet. This visual is in preview mode. Power BI team may add this feature in the future. Not sure about this. Can I just see the top X key influencers? I do not see my key influencer in this visual? Yes, this can happen. Based on my R code using RandomForest, Age should also be an influencing factor for attrition but doesn’t show up in Power BI visual. See this scatter plot. If Age decreases, Attrition % increases. Maybe Power BI just checks how the “increase” direction of a factor increases Attrition % or Maybe the number of data points for lower age and high attrition is less. Can I export the data for segments? Does this visual analyze multiple factors and provide conclusions? I do not think so. In the example below, the likelihood of Attrition % increases by 11.58x if monthly income goes up. But why is that so? Could it be because for those employees the YearsAtCompany is also more? Maybe Power BI visual needs to remove outliers. Power BI visual, currently, doesn’t analyze this for us. Why are employees leaving if we increase their monthly income? I want to set this up for my data? Ok, here are steps to achieve this. Step 1: Download and Install Power BI Desktop Feb 2019 from here. Step 2: Enable this visual from “Preview features”. Step 3: Restart Power BI Desktop. Click on the visual highlighted to put it on the canvas. Step 4: In the visual data options, drag the field to analyze in “Analyze”, and possible influencers in “Explain by”. Note: The visual is evaluated on the table level of the field being analyzed. 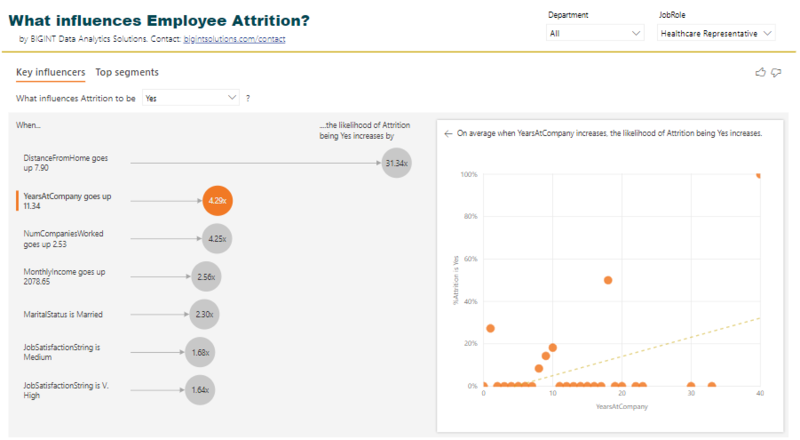 In this case, we are analyzing Attrition, and hence the visual runs at an Employee level. So you may not need aggregations on “Explain by” field. Otherwise, appropriate aggregations are required. Step 5: In the visual select “Yes” in Attrition value. In your case, select the value you want to analyze. No code, drag and drop solution to key influencers analysis in Power BI! PS: This visual is currently not supported in Power BI Embedded, Publish to Web and Power BI Mobile scenarios. I’m glad to inform my readers that Microsoft is adding new AI capabilities inside Power BI. And, these are no-code solutions. Let’s check these 4 new exciting capabilities in detail and in the order of quick wins as per me. In this post, I will explain uses cases with examples from multiple industries for each of the new capabilities coming in Power BI. This will be followed by a general approach to solve such problems, and then the new AI + Power BI approach to solve such problems. Note: Per Microsoft this would be available to all Power BI users. 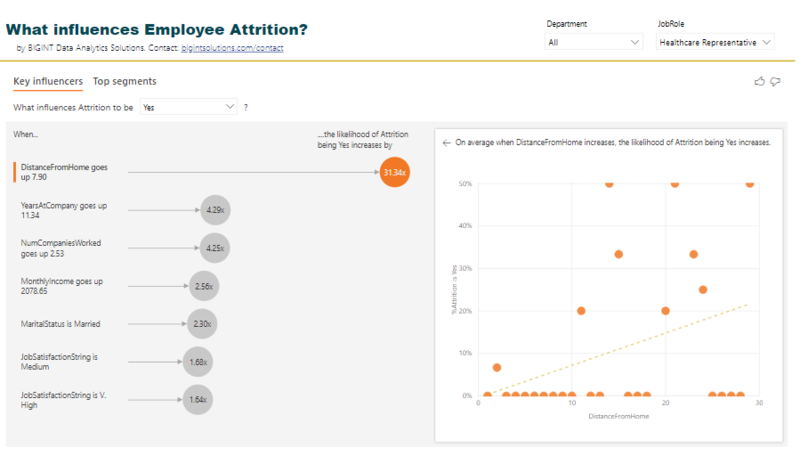 Suppose you have a dataset of employee attrition which includes details of the employees who are in the company, who left the company along with age, gender, salary, job role, satisfaction, education, years with current manager etc. Your task is to find factors influencing attrition. Why are employees leaving the company? What segments of employees are leaving? A general approach for answering such questions would be to use R or Python, fit a model (say using Random Forest algorithm) or use techniques like RFE (Recursive Feature Elimination) to find out top factors affecting our label – Attrition. More details on this general approach and how we did this using R and Power BI is mentioned in detail in our case study here. With new AI capabilities in Power BI, this would be just a click away. The outcome of the analysis from Power BI would be shown as a kind of “lollipop” chart as shown below. From the screenshot it is not clear how multiple driver analysis can be performed: Ex: When parental encouragement is true and Gender is male – what happens then? A contingency matrix would have helped in this case. You started a campaign on Twitter and would like to analyze your users sentiments – positive/negative. For a call center company you would like to analyze chat script and identify key items customers are talking about right within your BI reports. Or, an E-Commerce company would like to detect objects in the images attached with customer reviews, and identify which product/brand is causing negative sentiments or causing pulling “Andon Cord”. A general approach would be to use Azure Cognitive APIs inside your Power BI report using Power Query (more about this later) using calls such as: Web.Contents(AzureAPICallWithParams). Another general approach would be to develop and use custom Deep Learning models. A Twitter sentiment analysis (racial vs non-racial tweet) model was developed by us and is hosted in our GitHub repo. With new AI capabilities in Power BI, this could be just a matter of invoking a function from Power BI ribbon. We do not know yet how this will be invoked by users. But, definitely this will make our BI reports comprehensive and improve decision making. A snippet of such comprehensive report is attached below. When this comes out in preview we will have to see if Microsoft has provided ability to not fire API calls for items already tagged/analyzed – otherwise you will have to pay for every API calls (even for repeats). Imagine in your Power BI report along side Sales Oppty data I provide you a confidence score or probability score against each Oppty data. The Oppty owner can look at this number and decide which Oppty are more likely to be won so he/she can then focus his/her efforts on top highly likely Oppty. A general approach to add this would be a data scientist developing such models and a developer integrating it inside the Power BI report, and a business analyst consuming the report. With new AI capability, Microsoft is targeting business analyst so they can build, train, and apply the models right within Power BI service without writing a single line of code. Isn’t that waow? When this feature is out in preview, we will have to see how easy will it be to do feature engineering – feature selection, normalization, pruning, binning etc. But, this is for sure going to ease out the effort in long term. This capability is more of easing out collaboration between a data scientist and a business analyst. Typically a data scientist builds models in Azure ML platform and publishes the model as API endpoint. A data analyst or engineer uses that model endpoint to predict outcomes and populate the data inside the BI report. This BI report is then consumed by a business analyst. In the new AI approach the models developed by data scientist would easily be searching in Power BI, and a new interface would be provided in Power BI to hook to that model and use it in reports. There are no screenshots for this capability by Microsoft. The public preview of these capabilities will be launched towards the end of Nov 2018. We would evaluate these capabilities and posts about it when they arrive. What thoughts you have on these capabilities? How are you going to use these capabilities?